Tubular peyote stitch is really easy to do. You can find basic directions at many of the links listed on my Online Basics post. Try Beadwork at About.com to start. The first place I ever personally saw the twisted peyote spiral was in Carol Wilcox Well’s The Art and Elegance of Beadweaving, in a bracelet designed by Suzanne Golden. Since then, I’ve seen many variations on this simple idea, including a recent article in Beadwork Magazine (Jun/Jul 2008). If you want a true step-by-step tutorial complete with illustrations, I would recommend one of these two sources. However, if you’ve already got familiarity with peyote stitch, and odd-count tubular peyote in particular, you won’t have any problem figuring this out on your own with my simple instructions below! 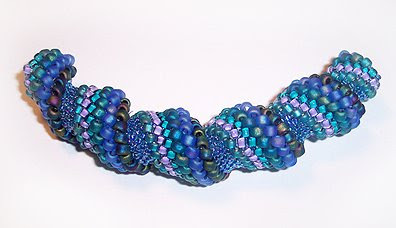 Twisted tubular peyote stitch is also very similar to Cellini stitch, which is simply an even count variation. 1. I used size 6/0, 8/0, and 11/0 seed beads to construct my beginning circle. I started with several colors of 6/0s, 2 beads of each, several colors of 8/0s, also 2 beads of each, and almost twice as many 11/0s, all in one color. Make sure that your beginning circle has an odd number of beads total. Tie the circle together and go around it again, exiting through the first size 6/0. 2. As you work your way around the circle, you will be doing tubular peyote stitch, adding the same size and color bead as the one you just exited. Your last 11/0 will be a step-up. I made my beaded bead 5 inches long. 3. To finish off each end of your beaded bead, use 11/0s and decrease the rows until you have just a narrow opening to string through. 4. Cut cord strands to 70 inches, and use a long piece of scrap wire to thread them through the beaded bead. Construct the necklace strands the same way as Breezy. 5. Knot the strands to the bar clasp; glue the knots and clip close when they’re dry. me too. Im using it on Pinterest, but gave you credit. I make no money, as all my stuff is free. Hope this is okay! I have been looking for creative ways to use the Cellini spiral, and yours is a beautiful one! May I create a necklace to sell using this pattern? If so, how would you like me to credit you for the design? 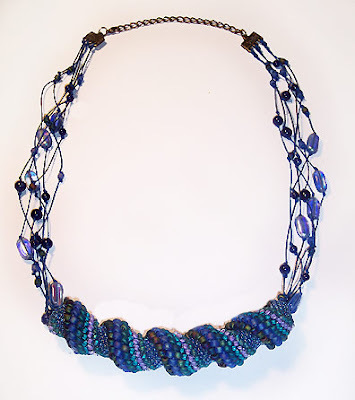 Of course, mine will be completely different, just the general idea of using the knotted beads for the necklace. Thanks so much! Thank you very much for your inspiration. I love your work. I just chanced upon your page and love the glass beads and the patterns you so genenrously show. Regards.